2018 was a successful year for Crelate and our customers. We launched many exciting new features to the Crelate recruiting platform, we partnered with some new organizations in the recruiting industry, and the Crelate Applicant Tracking System received awards of excellence from software vendor review platforms like Capterra, G2 Crowd, GetApp and Software Advice. In 2018, we reached a new milestone with over 900 recruiting teams and roughly 5,000 daily users of Crelate’s recruiting platform. We’re so proud to help our customers achieve their recruiting goals and look forward to helping more in 2019! 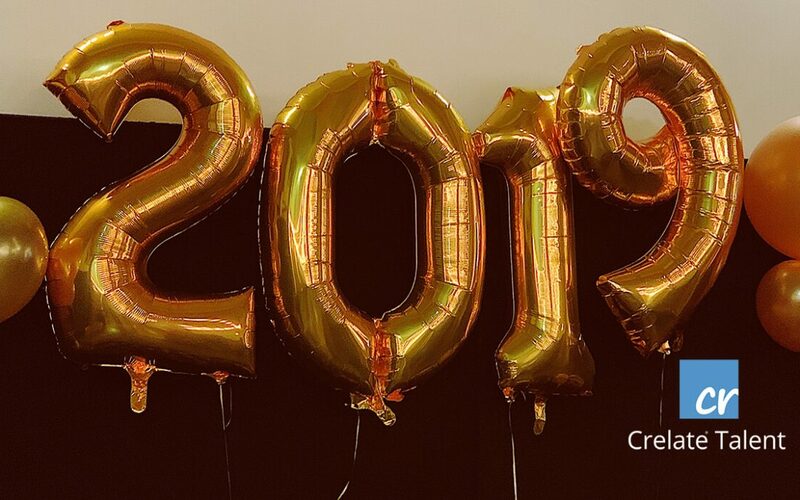 To take some time to reflect on the achievements of last year, and get ready to dive into 2019 with new ideas and goals, here’s Crelate’s 2018 year in review. Crelate started off 2018 with server updates to ensure state of the art capacity, security and speed of our infrastructure so that recruiters can be more productive with a fast and reliable applicant tracking software. This improvement made Crelate’s server environment 100% encrypted at rest, utilizing Microsoft’s Azure encryption and security monitoring capabilities. Crelate also received a “Best Software Company of 2018” from G2 Crowd. In February, we launched a feature allowing forms to capture recruiting information, called Activity Templates. With activity templates, recruiters can capture the repeating information that they’re always asking candidates for. This standardizes the recruiting process so that no steps are forgotten. Watch a YouTube video to learn how to configure Activity Templates in Crelate. During the same release, we also added more reporting functionality so recruiting teams can measure and optimize performance. Read all the details in our February 2018 release blog post. In March, we got involved in the local tech community by welcoming 2 development interns to work alongside the senior software developers who’ve been with Crelate since 2012. Crelate was also named a high-performing Applicant Tracking Software in a quarterly G2 Crowd reporting, ranking 6th highest user satisfaction ratings across 166 products overall. In a separate quarterly report by G2 Crowd, Crelate ranked among Top 10 “Easiest to Use” and “Most Implementable” Applicant Tracking Systems for spring 2018. Later in May, we featured our first case study on the blog with a customer in the automotive industry, Tire Talent. The company’s founder, Mike Cioffi, estimated a 5x productivity boost after using Crelate to accelerate talent acquisition efforts. In June, we launched Text Messaging by Crelate, allowing recruiters to reach and engage with contacts through texts. Texts can be sent directly from a Crelate account on a desktop or with the Crelate Connector mobile app. July was a busy month for Crelate full of exciting feature releases! We released a Spark Hire integration, so that recruiters can administer and schedule video interviews from a Crelate account. We added more integrations with Microsoft, including an Office Online integration so that Office 365 users can edit and modify Office documents (like resumes and cover letters) within Crelate. In August, we grew the team and our customer count, with over 850 customers and counting. In September, we updated Crelate features including texting, engagement tracking, and activity templates to help make recruiters more productive. In October, we explained the importance of a Recruiting CRM and why this software is crucial for recruiters managing demand pipelines and talent pipelines concurrently. In November, we attended the annual NAPS conference, without conference SWAG but with new Corporate Social Responsibility campaigns that reduce waste and fund charitable causes that benefit the greater talent acquisition community. We also announced our integration with Interseller, a web parsing and email sequencing tool that helps Crelate users with their sourcing efforts. In December, we moved to a new office because our team outgrew the old office. Luckily the move was simple and short, to a bigger office in the same complex. We celebrated with a team Happy Hour and game night. We also are excited to offer a 50% discount on the Crelate platform for verified nonprofits, as of December 2018. 2018 was a great year for Crelate and looking back on the year has us excited for all that’s coming in 2019 (and our roadmap page will give you an idea). We look forward to continuing our mission of consistent improvement in 2018. Crelate will keep improving and bringing the best recruiting software to talent-focused businesses everywhere.